Welcome to Railway Lofts. This unit is currently taking a fresh coat of paint throughout and being professionally cleaned. With nearly 1600 square feet of living space this is a MUST SEE. The beautiful wood floors are radiant in the sunlight that permeates this amazing space. Large commercial style windows take up an entire wall of the unit. The private balcony which faces north brings one more feature to the unit that makes it a must. With two large bedrooms and 2 full baths this loft has it all. The gas range is perfect for cooking that gourmet meal. Eat at the center island or engage family or friends while cooking. The gas fireplace in the living area creates that special warmth so desired during winter months. The lift that accommodates 2 cars just keeps adding value to this property. 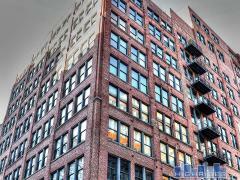 Located on Washington Avenue and just steps away from City Museum this loft has it all. Painting and cleaning will be done in the near future. Fiber available. Schedule your appt. today.